Long, unclean and uneven nails, are not just unpleasant for the eyes, but also, quite unhygienic for the body. A regular nail care routine helps you keep your nails clean, healthy, and free from all sorts of germs and dirt. This is vital for a healthy lifestyle. If the nails are not clean, filed and shaped, no matter how much you spend at the spas and on your attire, you will never get the complete look. But, the problem arises, when you set out to buy the complete nail care kit for your home care routine. The markets today are flooded with options and equipment that let you file, massage and manicure your hands and feet at your convenience. Picking out the right one can often be rather tricky. So, here we are once again to help you make the right decision. Intimidated by nail drills? Many of us are! These machines may seem quite overwhelming at the first glance. However, the PureNails 7-piece system is really easy to use. It comes as a complete set with seven attachments and helps in cleaning, filing, shaping, and toning the nails. 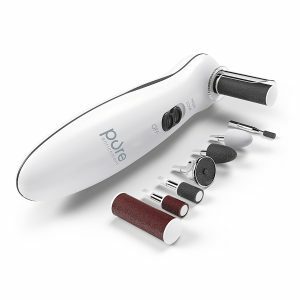 This is a very powerful unit and also includes a LED light that helps you in going around the tricky areas and for getting a smooth finished look. It is quite light and great for traveling as well. Just toss it into the carrying case it comes with and keep it in your bag or purse and have it ready for use no matter where you are. You can choose from two-speed levels and go around the tender areas slowly and remove the tough calluses too with ease. Plus, it is also backed by a two-year warranty by the manufacturer! So, if anything ever goes wrong, you are covered! There are seven attachments, you can use each individual attachment for filing, removing calluses, polishing, grinding the harder nails, and also to get rid of the painful ingrown nails in no time! This system is highly preferred by users all over the world due to its portable size, precision control, and efficient performance. Very user-friendly, it gives you the most reliable results in the shortest time with the least effort on your part. Simply put, the PureNails 7-piece professional manicure and pedicure system is love! May heat up the nails rather quickly. The unit may vibrate unpleasantly if not gripped well. Next, we have the Pure Enrichment 8-in-1 kit. This one too comes with a dual speed setting, that gives you a better control over the rough and sensitive points. There are eight attachments that work on the calluses, help in filing and buffing the nails to give you a complete finished look. Tired of having to look for sockets and electrical outlets at every station you land at? This one runs on 2 AA batteries! No need to go looking for the right sockets or having the cord getting in your way as you go about filing your nails. As an additional feature, it also has a protective cap that keeps the nail flakes from falling and creating a mess when used. Use it per your convenience and enjoy the perfectly buffed, shiny and healthy nails all around the year, sitting right at home. You can easily remove calluses, no matter how stubborn, and shape, buff, polish and file your nails to get a complete manicured/pedicured look. And if it couldn’t get any better, you get a complete two-year warranty with the unit! A perfect travel partner, this kit comes complete with eight easily adjustable attachments. You can work around the edges of your nails and let it take care of all types of corns and calluses, and get smooth, shiny and buffed nails in no time. Does not run on electricity. Comes with the user manual. If you are looking for professional, high-quality results, we have the great German manufacture, the Home Pedicure PediNova III. This one comes with fourteen professional attachments and a 20,000 rpm high-speed motor. The device is great for acrylic nails whether you wish to work it on your hands or feet, and also comes with a travel case. Very compact and portable, you can take it with you no matter where you go. Backed by a year-long warranty, this is a very high performing machine. You can choose from four different speed levels, for a precise control and for tackling those tricky areas with ease. So go ahead and smoothen your nails, shape, buff and file them at home. You can also use it for getting rid of the painful, annoying calluses. So, whether you wish to use it at home, office, workplace or on vacations, you will love the professional finish it leaves on every time. A must have for the best results! A very professional type of device, for giving your nails a complete makeover within minutes. It includes fourteen different attachments for multiple functions and four-speed controls. You can enjoy the same professional results right at home, without having to book appointments at the spas or salons. May take some time to get used to. Another option for professional use and results. The Medicool Pro Power 30K Professional is designed to give your nails a completely new look with its high power motor and performance. You can adjust the speed to suit your requirement and use the device in the forward or backward direction as well. Although it comes at a really high price, as compared to its counterparts, however, you will definitely never miss a spot or nail with it. A very durable, high quality and powerful device. Doesn’t take long to get used to it as well. There are no annoying vibrations, heat ups or grip issues. Plus, you also get a DVD as part of the package that gives you the complete instructions for use. Also, there’s a complete one-year warranty for the product, so in case anything doesn’t go as promised, you are completely covered! A very responsive and reliable nail drill, it has everything you need for your nails. As an added feature it also includes the foot pedal that gives you a complete hand’s free use. All in all, a great product for the professionals, do-it-yourselfers and even for the beginners to nail care. 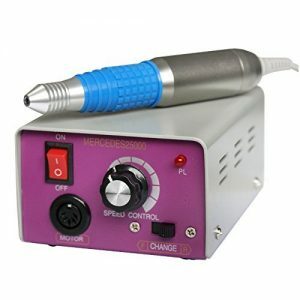 With a high power motor, the device is very comfortable and reliable to give you perfectly done nails, every time. You can use it in the forward or backward direction, set the speed to get a complete control without any heat-up issues. The unit also doesn’t vibrate, and that gives you a better grip and lets you get the job done smooth and right up to perfection. Forward and reverse controlled movement. Replacement parts are not found easily. An aesthetically designed machine for nail drilling and general nail care. This one, however, requires a certain practice to get along with. First of all, continuous usage for hours could lead to the unit getting heated. So, you may have to take breaks between use or turn off the unit whenever you feel the heat levels rising. Plus, the sand bands it comes with, are loose! That often makes them rather useless, as they may fly off while the device is powered on. On the positives, it is CE certified for safety. You can also use it forward to bring it backward while doing your nails. Plus the tools allow you to grind, sharpen, polish, carve and carry out a multitude of actions on your nails. You can also go for the acrylics and other professional nail treatments, with the powerful motor. Other features include the variable speed settings, gripping hand pad for long time usage, 6 attachments with 20 standing bands. 30,000 RPM, highly powerful motor. The sandpaper covers do not stay on for long. The Zeny 25000RMP electric nail drill kit set, is not one of our highly recommended products. For one, it does not yield much power or even as much as promised. Many of the machines that work on slightly lower levels of RPM function better and give you a higher performance than this one. The foot pad is not an option with this. You just HAVE TO use it for all the settings as it does not function without it, except for the speed. As soon as you take your foot off it, the device completely shuts off. Plus, there are no such clear directions or instructions for use enclosed in the package. Often it takes simple trial and error or watching some good YouTube videos that get you started on the product. At higher speed settings, many of the users also found that the unit got stuck and would have to be turned off and then on to get it back to work. It does produce less noise and vibration, that makes it comfortable for use, however, with some really better options that we have discussed above, it would be fine to let this one off your purchase list. The most striking thing about the product is its looks. It is made from the metallic material that gives it a robust and sturdy appearance and comes with variable speed settings. Also, as it is certified for safety, it meets the standards and does not dangerously heat up or cause damage. Not a very powerful device. Technology is ever on the rise to make things better, easier and all the more convenient for us. Taking care of our nails and making sure that they stay trimmed, shaped and beautiful, is no easy task in today’s world. The appointments, time and effort, often makes nail care fall far behind in the beauty care regime. But today, these electric nail files, are here just to make the job easier and possible for everyone. Choosing the right e-file, however, can be a tad bit tricky. First and foremost, how much does your pocket allow you to spend? There are options ranging from about $40 and going up to hundreds. Knowing your limits will help you narrow down your choices. However, if you have a lower budget, don’t worry! You can often make a wise decision and instead of spending hundreds of dollars, you can find the same features and functions in a much cheaper variant. The more important aspects in this regard are the durability and quality of the product. Whether you wish to buy it for personal or professional use, it has to be long lasting and of high quality. Most of the good brands offer a year-long or even two years warranty. Make sure to find one that offers the same. It will keep you covered and you can always contact the seller/manufacturer in case anything goes wrong. Many of the sellers also provide all-around technical support and after-sales service to their clients. The speed of the nail file is usually expressed as RPM or Revolutions per minute. Usually, the most preferred speed range is between 5000 and 25,000 RPM. The higher it is, the better your experience will be. It also depends on how much you intend to use the device and also for the professional and personal use. You may opt for a low-speed unit for personal use. The low speed or even the less power consuming drills are great for use at home. However, if you are looking for one for professional or heavier use, and the type of nails you intend to use it on are hard, tough and/or artificial, you may require a higher speed and strong battery. Many of the units also give you a complete control over the speed. You can choose from a minimum of two speed levels and increase or decrease as required. This is very important particularly if you are working around the cuticles say, as you need to be careful while trimming the edges. Here, you can keep the lowest setting for the speed. For simple filing, you can set it at the higher speed. Many of the electric files create noise or undesired vibration. This is typical, especially when used for a longer duration or at a high speed. But, there’s good news. You can easily find many of the noiseless and vibration free versions. Although many of these may be available at a slightly higher cost, the peace and smooth experience you get with the noiseless types makes it worth the purchase. The more powerful the machine, the less hard you have to work. It takes on the work itself and does not require pressure or effort from the user. So, make sure to go for the powerful type, as it lasts longer and makes your job easier. For a heavier usage, say once every day, or about thrice a week, you will have to look for one that is durable and reliable. Professionals, for one, have a much heavier requirement from these drills. So, although it may demand a greater budget, the device has to be long lasting and able to take on the load. If you love prim and perfectly manicured nails and wish to rock the look all through the year, you may need a higher maintenance. For that, the usage of the file significantly increases. So, you definitely need a lasting and reliable device. These files are available with wires and also without them. For personal or home use, you may consider the wireless files. These are convenient for use and do not entangle or lead to any other hassles. Moreover, you can easily toss them into your purse and use anywhere while traveling or at work. However, the compromise here is the battery life. You only get about 2 hours or so with the cordless versions. So, for the professional use at the salons, the wired ones are a better option as the battery lasts longer and gives you a powerful output every time. The right size is really important and can make the experience very smooth as well as highly uncomfortable. The ideal electric file, must be light or average in weight and not very bulky. The brand name often implies higher performance and reliability. Make sure to go through the personal reviews and always opt for the higher rated brands, for a safer choice. However, if you are a beginner and are not equipped with the right knowledge to make the purchase, just make a list of the features you need. That, combined with the basic knowledge of the specifications such as speed, bands/attachments, etc. can get you on the right track in no time. However, no matter which type, size, brand or quality you go for, always make sure to use the product right. The wrong usage could actually lead to disastrous results. The nail growth may be repressed or the enamel could get damaged. You will find countless articles and videos on using these products. We recommend, that you must always go for the user manual or instructional DVD etc., that comes with the package from the manufacturer. Make sure to keep your file clean and free from bacteria and germs. This is very important whether you use it at home or at the spa. Make sure to clean after each job! Use soapy water or a scrub to cleanse the attachments especially. 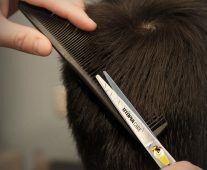 Make sure to get rid of all the buildup and dead cells, before using it on a different client or storing for later use. Do not apply oil to the attachments or device itself. Oiling the device at any point can actually increase the friction and cause more damage than doing good. Keep your device and all attachments dry to ensure that no fungal growth infests them. Do not exert too much pressure while cleaning the inner area of the nails. This can cause damage and may be quite painful as well. Always ensure that the attachments are affixed securely. Always keep a low speed while going through the cuticles. For shaping the nails, you may increase the speed. However, at any point try to avoid going to the max. speed. This can actually heat up the device and cause irreversible damage to the skin and nails. How do these electric nail files work? The electrical files are small sized and designed to easily fit your hand. The tip of the file starts moving or rotating at a high speed as you turn it on. This tip is termed as the ‘drill’, as you go about your nails, you can shape, file or cleanse them of the debris. You can use these on both the natural as well as fake nails, to shape them. But, their functions go far beyond than just shaping or filing the nails. You can refill, repair the cracks in acrylic, get rid of calluses, and also buff your nails and cut off the dead cuticles. For more details, read on here. What can the electric file be used for? The electric nail files may seem quite dainty and small for doing much for your nails. However, filing is only the basic job these are designed to do. Fixing Acrylic Nails: Artificial acrylic nails often lose their ground and get lifted with time. These devices can easily fix them back to their original position, making them good as new. Manicure/Pedicure: You can give your natural nails a complete mani or pedicure with these files. The attachments will help you remove the dead skin cells, make the cuticles smoother and refined and help buff the nails too. Backfill: Backfilling with the electric files is really easy. Even if you are new to the technique, you can easily do it with the controlled motion using these hand devices. You can maintain a lower speed and cut and fix where you feel the need, with ease and without much effort. Fixing cracks on Acrylic Nails: Cracked acrylic nails is not an uncommon phenomenon. But, these files offer a great way to fix them. Using the right attachment you can easily secure the cracked nail back to its original state, and most often, the nail looks good as new. Do you need to consider the type of nails when buying the electric file? The type of nails you have or need the device to work on is very important when selecting the right file. Nails can be soft, hard, brittle, or rugged. You may also need to consider whether you will be using the device on the natural nails or the acrylic types. Since these devices have different RPMs and power. Thinking about the kinds of nails you will be working with is important. If you are a professional who has to work on ALL kinds of nails, you definitely need to make a high-quality purchase, that comes with a strong motor. 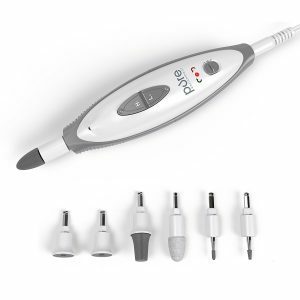 The electric files offer the convenience and give you the best results as and when you want. Whether you have a sudden invitation to a wedding or party, or a surprise engagement announcement to make, these files are a dream come true. So don’t ‘awe’ and ‘Aaah’ at those to-die-for nails, take a hold of these magical sticks and own them right away!